Ideal for picnics, concerts, and travel the Multi-Bottle Wine Cases & Wine Carriers offered at Beverage Factory are high quality cases sure to get the job done every time. 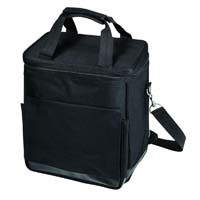 Packed with features and constructed with insulated materials, these portable wine carriers keep your food and beverage fresh and looking elegant for any occasion. Lightweight and durable, the wine cases available at Beverage Factory are the perfect addition to any adventure.